I just had to interrupt the tape recorder because the doorbell rang, and it was Ken next door with a bag of grapefruit and a big lemon. He said it's the last of the grapefruit. He and his wife cleaned up the whole tree. So he brought me over a nice bag full that I use for making juice. I also cut some up and make fresh fruit salad. I cut the grapefruit up in small chunks without the seeds or skin. 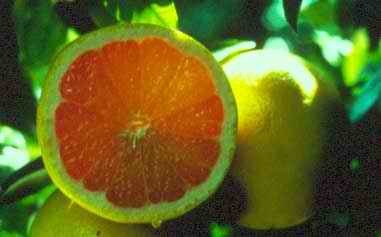 Just the plain clean part of the grapefruit, the whole heart of it. I cut it up into nice small pieces, bite-size pieces, and put them into a nice clean mayonnaise jar. Then I fill it up with juice and put it in the refrigerator to chill. I have about two jars in there right now ready to be used. As the summer comes on I will reach in there and grab some nice cold grapefruit. I enjoy it. Sometimes at night while watching TV, I'll want some fresh fruit and I'll reach in there and get a dish full and eat it. It's very refreshing. I like fresh fruit at night. I buy apples and eat one or two at night while watching a TV program. Anyway, Ken brought over the grapefruit and said that it's the end of the fruit this season because there are new blossoms coming out for next year's fruit. I thanked him very much because he does bring me a lot of fruit. He just managed to bring this bag as I finished the last bag he brought. He keeps me well supplied with fruit, and I do him different favors. I bring his garbage cans in whenever the garbage men come around, and put them by his garage door, so that they don't stand out there all day while he and his wife are at work. I guess he sort of appreciates it. Sometimes we exchange different things that we need. One hand washes the other. They are nice people, nice people to have as neighbors.